Back home from Comic-Con International: San Diego — and I am pleased to be able to share some news. I actually have three comic books coming out in October. In addition to two in a galaxy far, far away (Star Wars: Knight Errant #5 and Star Wars: Lost Tribe of the Sith #3), you'll see another from Springfield, U.S.A. — the first of several Simpsons stories I have coming up from Bongo Comics! 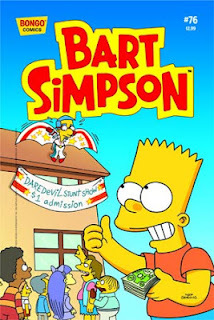 Longtime readers of the site may recall that I wrote a single story for Bongo nearly eight years ago; "No Purchase Necessary," drawn by Phil Ortiz and colored by Bongo stalwart Nathan Hamill (also a familiar name to Star Wars fans) appeared in Simpson Comics Presents Bart Simpson #27. The story has since been reprinted in the Big Brilliant Book of Bart Simpson, still available through Amazon. I loved writing the story and wanted to do more, but I was still moonlighting then and the Knights of the Old Republic comics launch and subsequent series took a lot of my time. My first Simpsons story appears here. But Bart will not be denied! 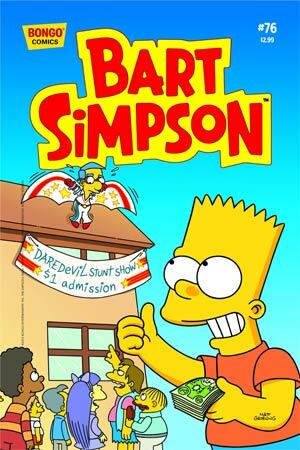 So October sees the release of Bart Simpson #76 and my story "Fund-Razing," with art by John Delaney. Bart's antics cause a school fund-raising drive to go horribly, comically wrong — and hijinks naturally ensue. My next story after that is already slated – and there's more to come. I'm thrilled to be back in Bongo's pages again. It's been the gold standard for humor comics for a long time, and it's allowed this fan of Carl Barks's Duck comics and Marge and John Stanley's Little Lulu to explore some truly wild schemes with that maddest of mayhem-makers, Bart Simpson! Bart Simpson #76 will be in your retailer's catalog in August. I'll post order links for it soon. Back to the convention: it was great, of course — one of the most positive San Diegos in recent memory, according to most attendees, and I concur. (I have posted some thoughts about the convention and the industry in general on my Comichron site.) It was great to see folks from my publishers at Dark Horse and Del Rey, as well as the Lucasfilm team; I did five hours of signings all told, including copies of the Star Wars: Lost Tribe of the Sith book that releases July 24. It was my first chance to get a look at the book, and it's a great package. Get your orders in now! And as always, it was great seeing my friends and colleagues out there — and also along the way. Fellow Star Wars author Troy Denning and I were on the flight together going out to San Diego — and I ended up giving neighbor and famed fantasy author Patrick Rothfuss a ride home from the airport after a missed connecting flight. It's a small, surreal world! 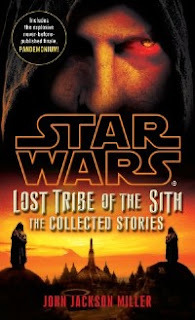 More posts coming soon — including more details on the July 28 Lost Tribe launch event at 3 p.m. at the Barnes & Noble in Madison, Wis. — the Rebel Legion will be in attendance! In the meantime, remember the words of Master Homer: D'oh — or d'oh not. There is no try!